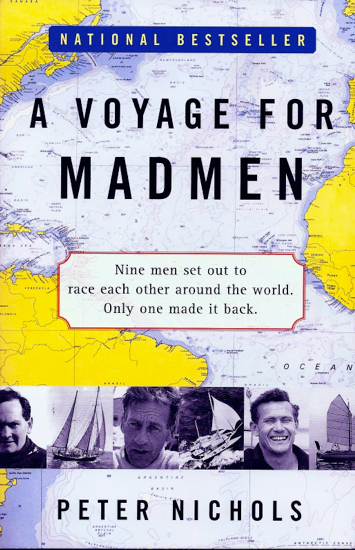 My Review: In 1968 nine men set off in nine small boats to circumnavigate the Earth, unsupported and non-stop. This was a race, the brainchild of the London Sunday Times, inspired by the solo circumnavigation the year before by Sir Francis Chichester, Sir Francis, however, pulled into port along the way to make repairs and re-supply. The Sunday Times rules would not allow any stops for any reason. I am very familiar with the cast of characters in this story: Chichester, Robin Knox-Johnson, Donald Crowhures and the inscrutable Bernard Moitessier in particular. For before I was a kayaker, I was a sailor, and my interest in sailing had just begun to blossom as the events surrounding this impossible race began to jell. 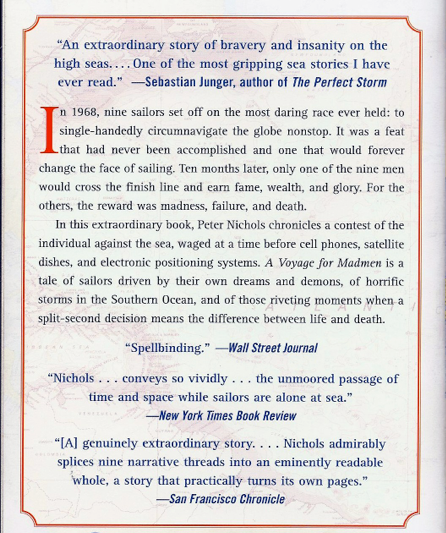 I had read Joshua Slocum’s classic book, Sailing Alone Around the World and Chichester’s book Gypsy Moth IV Circles the World. I was filled with the romance and heroic nature of the solo quest, a personal test of strength and character that such an adventure would bring. I had followed the accounts of Knox-Johnson’s voyage and Donald Crowhurst’s tragic madness in my sailing magazines at the time. But all this happened over forty years ago. It’s an old story, so I didn’t expect this book to be too engaging. I was wrong. This is an extremely well written narrative of the race, weaving the timelines, characters and events into a wonderful story that kept me on the edge of my seat. I felt like I was with the various racers, almost simultaneously. The book is written like the best disaster accounts, with minute by minure reports about what is happening as the race progresses and various competitors drop out. In the end, two racers commit suicide, the leader and presumed winner says “to hell with it”, and turns his boat toward Tahiti, leaving one man to complete the race. It is a great story with great characters written by a master at narrative writing. I recommend it highly.